Naples Culinary Walks – Book Tours! Begin your day in Paradise with coffee and donuts where luxury boats greet the sun. Your feet will travel the even, synthetic timbers of the dock to a traveler’s favorite, Cove Inn. The Cafe defies aging; but the freshest of breakfast fare from the griddle is ready for sampling. Next, have a “petit morceau” like a local with home-made takeout from Port Royal’s favorite caterer, carried by you to a stand-up “buh-bye” reception at an artists gallery. Get your morning constitutional by walking the 0.6 mile, mangrove bowered CLAM PASS boardwalk which delivers you to the beach. We’ll wait if you’re tempted to test the warm Gulf of Mexico by dipping your toes. We return on the 0.6 mile boardwalk to the luxurious NAPLES GRANDE HOTEL restaurant. A sit-down brunch curated for you the intrepid wanderer, is the final reward of this WALK experience. Galleria Shoppes in North Naples is an active hub for real Neapolitans in search of casual restaurants, fresh produce in season, and the usual errand destinations for everyday needs such as pharmacy, work out club, or professional services. We find out from Galleria restauranteurs how to brunch in many parts of the world by sampling small plates, before ending our shopping complex WALK at the seasonal and tantalizing Vanderbilt Farmers Market. 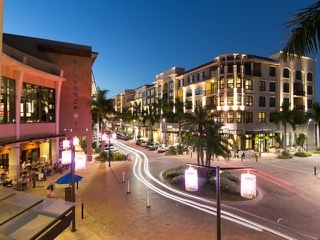 The VILLAGE is a peninsula of upscale shops and restaurants built with picturesque Venetian facades. It calls us to visit several upscale restaurants to compare their best small plates (and gorgeous water views!) Trusty food choices weigh in, just before a lingering last stop to cool down at Vermont’s famous Ben & Jerry’s Ice Cream store. FIFTH AVENUE SOUTH is the Champs Elysee of Naples, packed on each side with inviting restaurants, cafes, shops, pocket parks, and beautiful people. We survey small plates from five singular restaurants with their own global flair, including a charming gelato parlor. 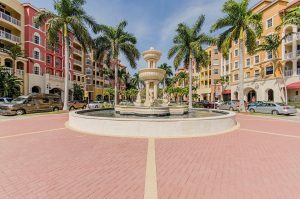 THIRD STREET SOUTH has tony restaurants, high-end shops and galleries, historic buildings, and is two short blocks from the iconic Naples Pier. We kibitz at the Pier, pass by a Naples Original to sit at a splashing fountain for gastronomic delights, see for ourselves what the buzz is about at Sea Salt, and savor our eclectic stops before selecting a creamy gelato for a velvety cool finish to our WALK. Where: On the turtle sidewalk in front of Naples Pier, west end of 12th Avenue South. Despite WATERSIDE’S ethereal Designer shops and exquisite waterscapes, this mall is family and pet friendly! Well socialized pets and human families are welcome to push strollers, strut on leashes, or otherwise enjoy sweet after sweet on this WALK. We circle the elegant outdoor shops, making four stops to enjoy culinary SWEETS. Depending on the best of seasonal ingredients, you may be happily devouring a serving of strawberry shortcake, soft as a cloud cookie, iconic key lime tart, vegan cupcake, or other sweet surprises. Where: In front of Waterside Valet, between Brio Italian restaurant and California Pizza Kitchen. MERCATO is the latest edition for Naples food and nightlife, under the approving eyes – well, actually windows – owned by upper floor residents along the approximately half-mile long Mercato Strada. From the Society Room to an intimate, conditioned air humidor, to a balcony overlooking coveted high-end cars arriving at valet, we walk to five stops for small plates and special insights at the best of Collier’s Mercato. Where: The open area in front of Sur La Table store, north corner of the US41 entrance to Mercato. BAYFRONT ia a residential community above a pedestrian friendly oblong plaza that has featured restaurants to visit and outdoor sports opportunities. The Gordon River opens into a lovely Bay which can be seen from US41, immediately south of downtown’s Fifth Avenue South. We enjoy olive oil & specialty tasting at funky Tin City to reminisce about what used to be Naples. We fast forward into the 21st Century by crossing to swank restaurants for small plate treats. Along the way, we meet Captain Julie at her vessel, In the Pink, for a specialty item that is uniquely Neopolitan. You’ll enjoy the food tour stops and the scenery – just as other mariners, food explorers, and wanna-be pirates did, who have gone before you.